Nice 5 “R” words in the title, eh? Let’s talk about rendering – a phase that comes in the Life of Page 2.0 after, and sometimes during, the waterfall of downloading components. Different browsers work differently, but the following diagram gives a general idea of what happens, more or less consistently across browsers, once they’ve downloaded the code for your page. The render tree would be the visual part of the DOM tree. It is missing some stuff – the head and the hidden div, but it has additional nodes (aka frames, aka boxes) for the lines of text. Figuring out what and how exactly to display on the screen involves a recursive walk down (a flow) through the render tree. parts of the screen will need to be updated, either because of changes in geometric properties of a node or because of stylistic change, such as changing the background color. This screen update is called a repaint, or a redraw. Repaints and reflows can be expensive, they can hurt the user experience, and make the UI appear sluggish. Some reflows may be more expensive than others. Think of the render tree – if you fiddle with a node way down the tree that is a direct descendant of the body, then you’re probably not invalidating a lot of other nodes. But what about when you animate and expand a div at the top of the page which then pushes down the rest of the page – that sounds expensive. Since the reflows and repaints associated with render tree changes are expensive, the browsers aim at reducing the negative effects. One strategy is to simply not do the work. Or not right now, at least. 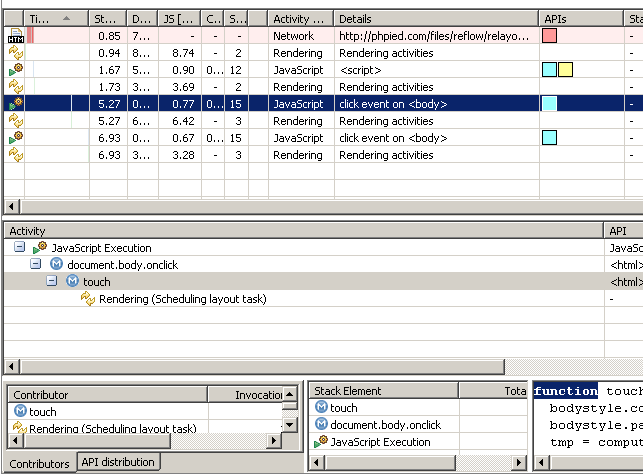 The browser will setup a queue of the changes your scripts require and perform them in batches. This way several changes that each require a reflow will be combined and only one reflow will be computed. Browsers can add to the queued changes and then flush the queue once a certain amount of time passes or a certain number of changes is reached. All of these above are essentially requesting style information about a node, and any time you do it, the browser has to give you the most up-to-date value. In order to do so, it needs to apply all scheduled changes, flush the queue, bite the bullet and do the reflow. The strategy to reduce the negative effects of reflows/repaints on the user experience is to simply have fewer reflows and repaints and fewer requests for style information, so the browser can optimize reflows. How to go about that? Don’t change individual styles, one by one. Best for sanity and maintainability is to change the class names not the styles. But that assumes static styles. If the styles are dynamic, edit the cssText property as opposed to touching the element and its style property for every little change. In general, think about the render tree and how much of it will need revalidation after your change. For example using absolute positioning makes that element a child of the body in the render tree, so it won’t affect too many other nodes when you animate it for example. Some of the other nodes may be in the area that needs repainting when you place your element on top of them, but they will not require reflow. Only about a year ago, there was nothing that can provide any visibility into what’s going on in the browser in terms of painting and rendering (not that I am aware of, it’s of course absolutely possible that MS had a wicked dev tool no one knew about, buried somewhere in MSDN :P). Now things are different and this is very, very cool. First, MozAfterPaint event landed in Firefox nightlies, so things like this extension by Kyle Scholz showed up. mozAfterPaint is cool, but only tells you about repaints. 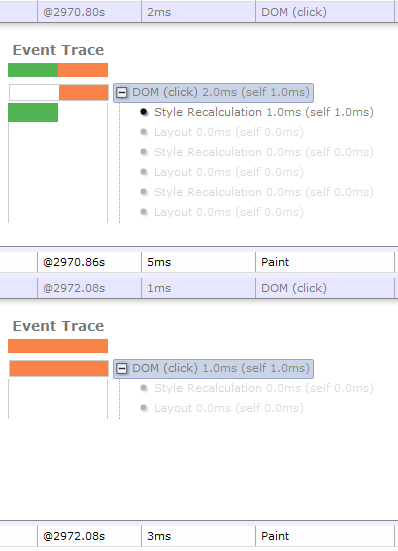 DynaTrace Ajax and most recently Google’s SpeedTracer (notice two “trace”s :)) are just excellent tools for digging into reflows and repaints – the first is for IE, the second for WebKit. Some time last year Douglas Crockford mentioned that we’re probably doing some really stupid things in CSS we don’t know about. And I can definitely relate to that. I was involved in a project for a bit where increasing the browser font size (in IE6) was causing the CPU go up to 100% and stay like this for 10-15 minutes before finally repainting the page. Well, the tools are now here, we don’t have excuses any more for doing silly things in CSS. Except, maybe, speaking of tools…, wouldn’t it be cool if the Firebug-like tools showed the render tree in addition to the DOM tree? Let’s just take a quick look at the tools and demonstrate the difference between restyle (render tree change that doesn’t affect the geometry) and reflow (which affects the layout), together with a repaint. Let’s compare two ways of doing the same thing. First, we change some styles (not touching layout) and after every change, we check for a style property, totally unrelated to the one just changed. Now, the two example style changes will be executed on click on the document. The test page is actually here – restyle.html (click “dude”). Let’s call this restyle test. This test changes the layout so let’s called it “relayout test”, the source is here. Here’s what type of visualization you get in DynaTrace for the restyle test. Again, zooming into the interesting part, you can see how now in addition to the “drawing” bar, there’s a new one before that – the “calculating flow layout”, because in this test we had a reflow in addition to the repaint. Now let’s test the same page in Chrome and look at the SpeedTracer results. This is the first “restyle” test zoomed into the interesting part (heck, I think I can definitely get cused to all that zooming :)) and this is an overview of what happened. Overall there’s a click and there’s a paint. But in the first click, there’s also 50% time spent recalculating styles. Why is that? Well, this is because we asked for style information with every change. Expanding the events and showing hidden lines (the gray lines were hidden by Speedtracer because they are not slow) we can see exactly what happened – after the first click, styles were calculated three times. After the second – only once. But the detailed view shows how the first click caused three reflows (because it asked for computed style info) and the second click caused only one reflow. This is just excellent visibility into what’s going on. A few minor differences in the tools – SpeedTracer didn’t show when the layout task was scheduled and added to the queue, DynaTrace did. 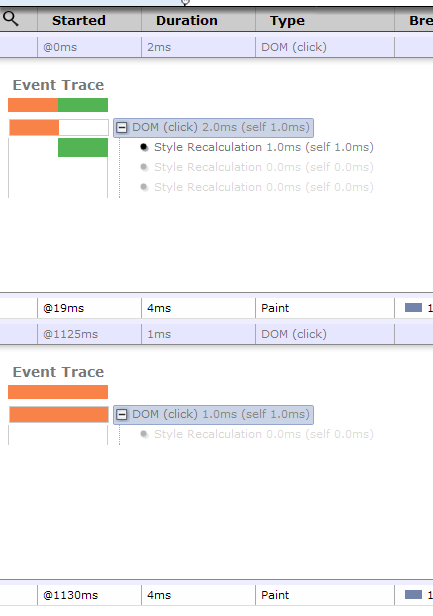 And then DynaTrace didn’t show the details of the difference between “restyle” and “reflow/layout”, like SpeedTracer did. Maybe simply IE doesn’t make a difference between the two? DynaTrace also didn’t show three reflows instead of one in the different change-end-touch vs. change-then-touch tests, maybe that’s how IE works? Running these simple examples hundreds of times also confirms that for IE it doesn’t matter if you request style information as you change it. Across all browsers though changing styles only takes half the time it takes to change styles and layout. (Now that I wrote it, I should’ve compared changing styles only vs. changing layout only). Except in IE6 where changing layout is 4 times more expensive then changing only styles. Thanks very much for working through this long post. Have fun with the tracers and watch out for those reflows! In summary, let me go over the different terminology once again. And some more reading if you find this topic fascinating. Note that these reads, especially the first three, are more in depth, closer to the browser, as opposed to closer to the developer which I tried to do here.